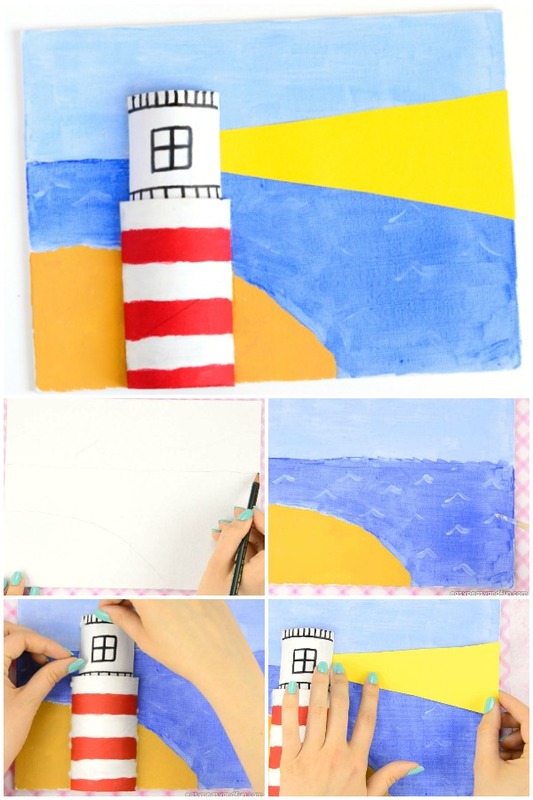 This lighthouse art for kids is a perfect combination of arts and crafts for kids to make. 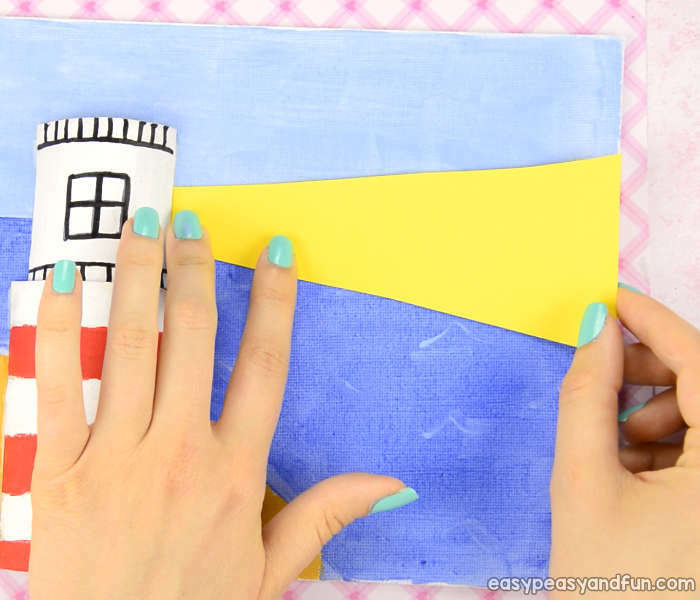 It combines painting and crafting with paper roles so it’s a project that gives kids confidence to get arty (and kids at heart too). 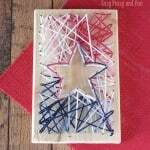 Kids will love making it as it’s a 3D art project, so it’s really fun to display too! 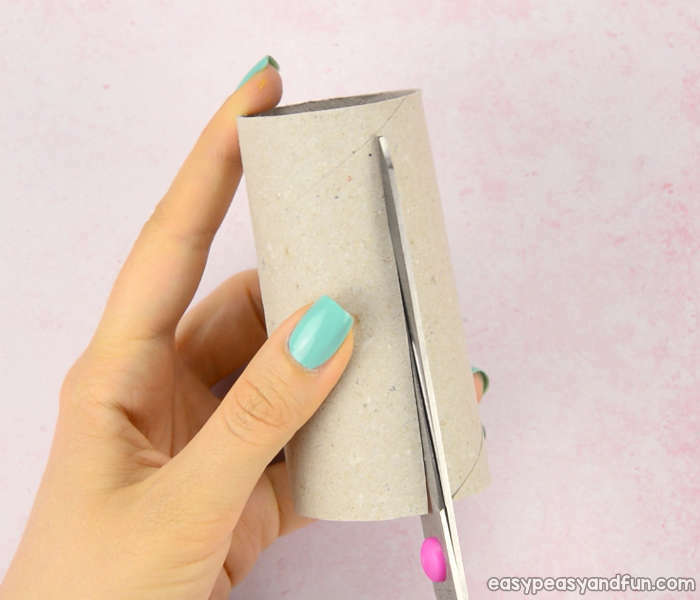 You can use toilet paper rolls, kitchen paper towel rolls or even regular paper for this project. 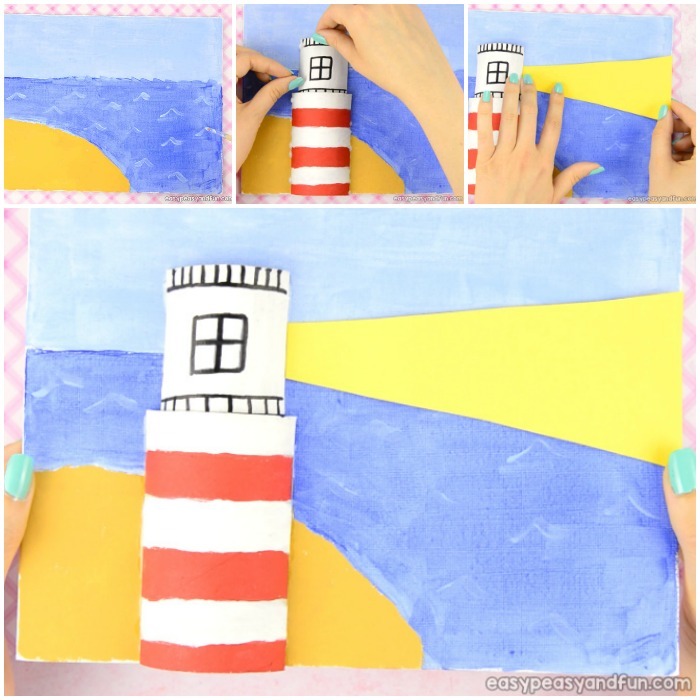 If you are looking for an easy art idea for kids to make during summer (this one is perfect for summer camp), do add this lighthouse art for kids to your list of summer crafts to make. 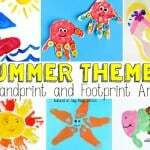 It’s perfect project for younger kids, as it isn’t a challenging one as far as painting goes, it’s a great one for beginners. 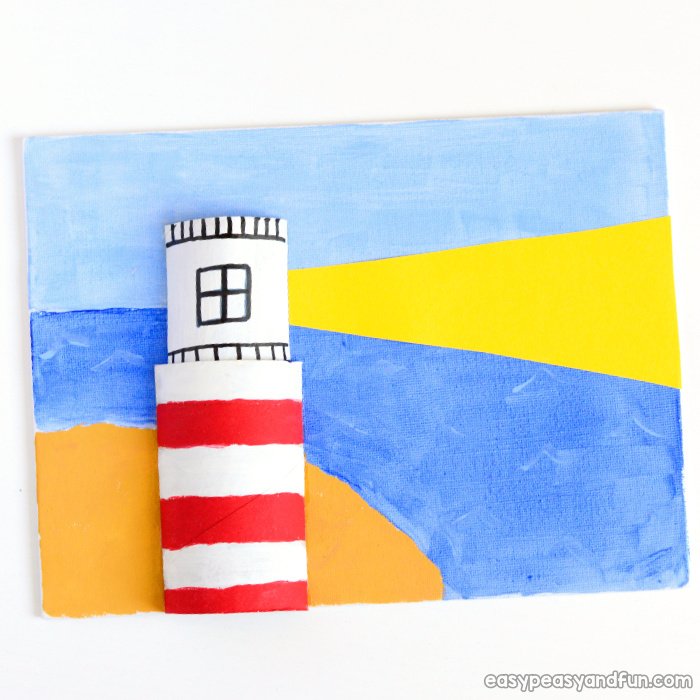 We made our lighthouse out of toilet paper rolls, but it can also be painted. 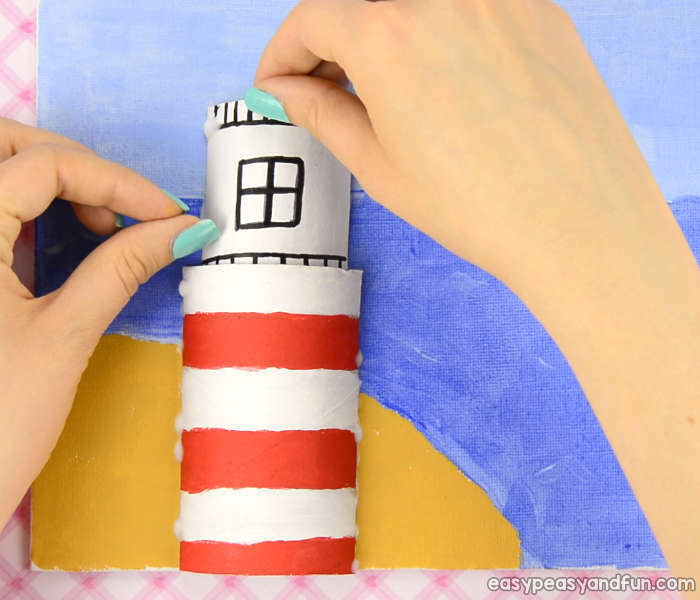 The paper rolls however do give this project that something extra as the lighthouse will pop out of the picture. 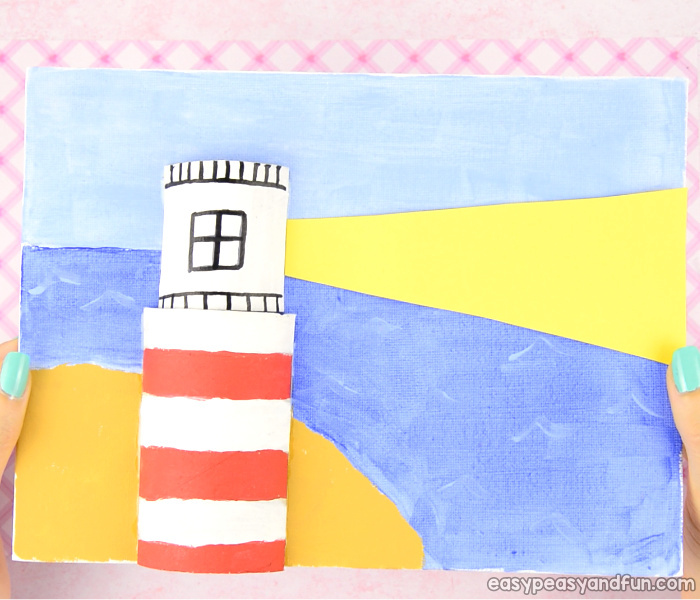 Using paper rolls instead of drawing a lighthouse is also handy if you have children who are not confident about their drawing (it happens) so a project like this might encourage them to slowly start expressing their creativity with drawings of their own. 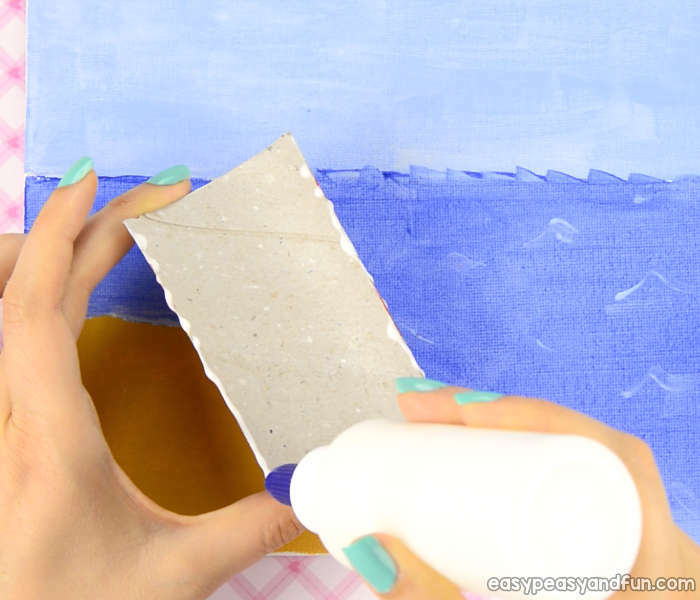 You can “freestyle” the painting or use a pencil to gently draw the outlines on the canvas. 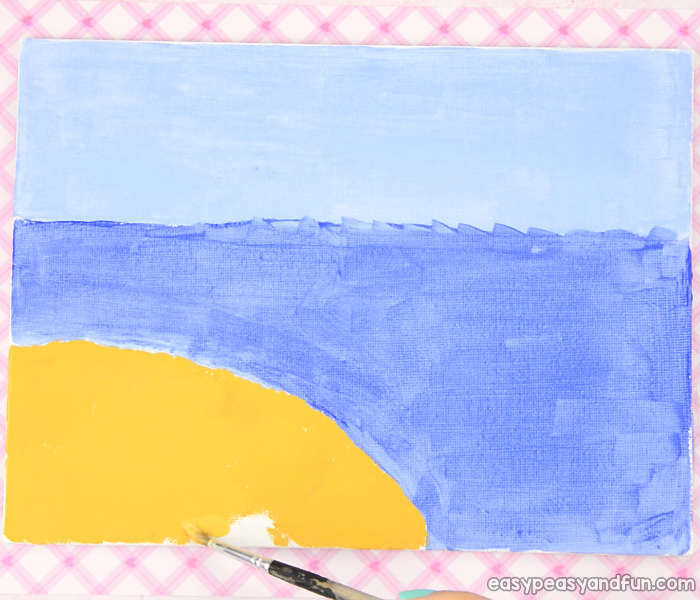 Draw a curved shape on one side of the canvas (to mark the island) and a straight line from one side of the canvas to the other for the horizon. We started by painting the sky. 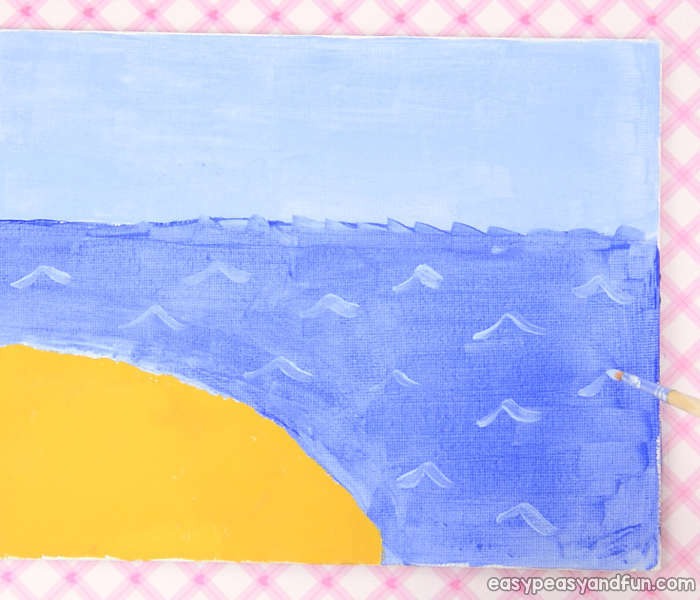 Next we painted the sea. Lastly we painted the island and added a few waves. 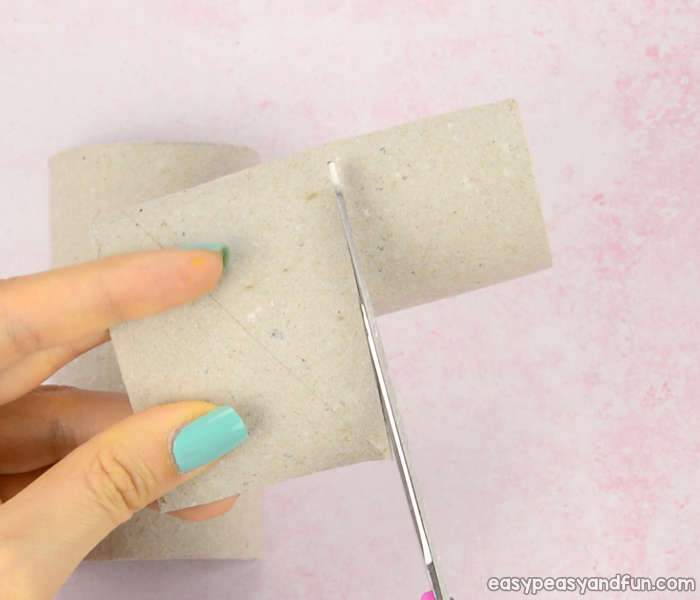 Take the toilet paper roll and cut it in half as shown on the image. Cut the other half in half as shown on the image. Trim the sides a little as shown on the image. 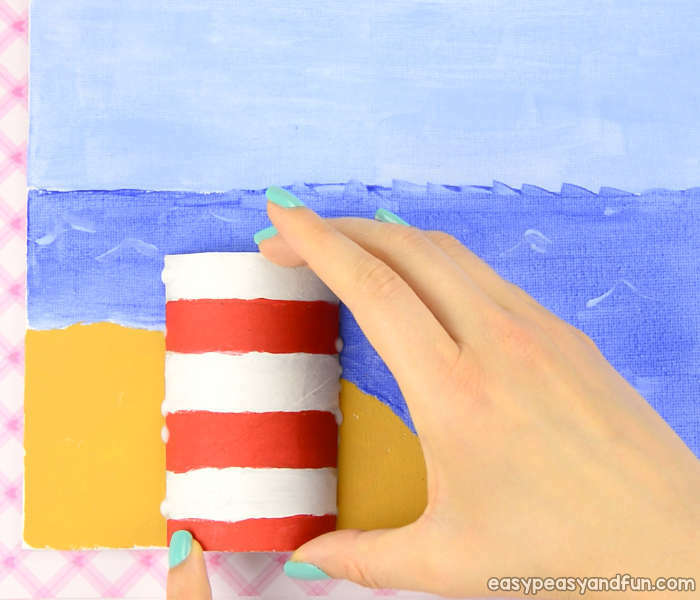 Paint the larger half of the paper roll. Paint strips of red and white. Set aside and let dry. Paint the smaller one white. Set aside and let dry. Once it’s dry, draw details such as windows with a black marker. 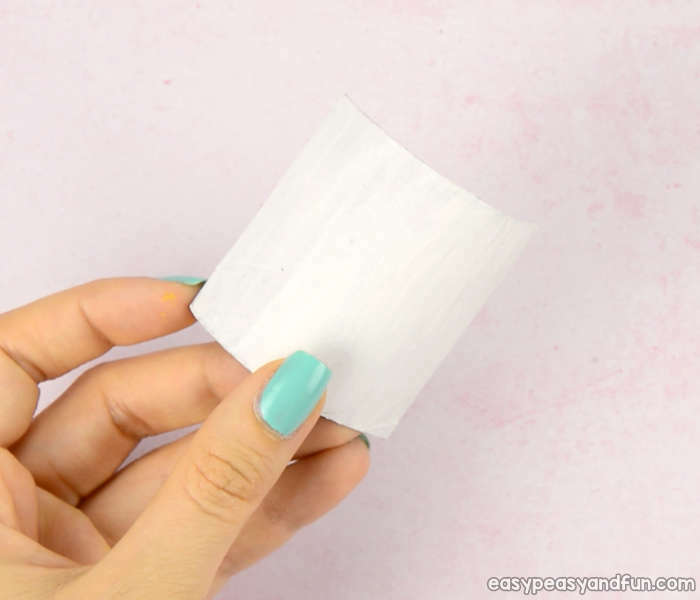 If working with larger group of kids, pour white school glue on a paper plate and have the kids dip the paper roll in – to get the glue on the edges. 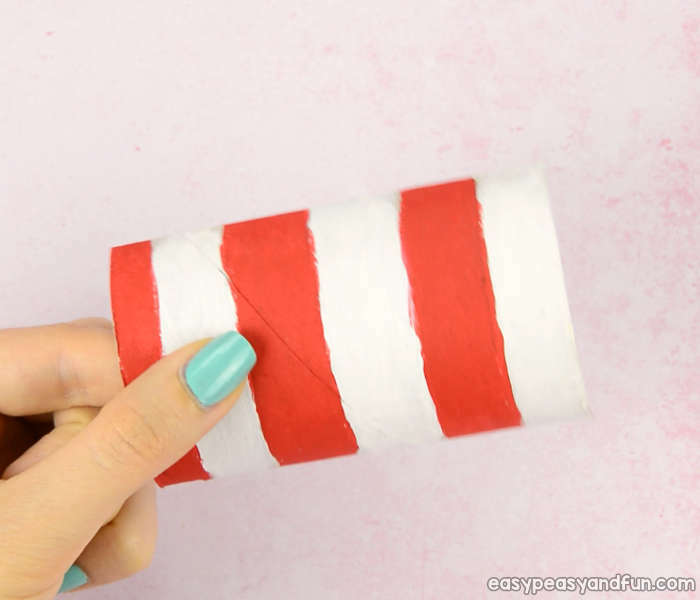 If one kid is making this craft, if fine motor skills allow, have the kids apply the glue on the paper roll (this will save glue). 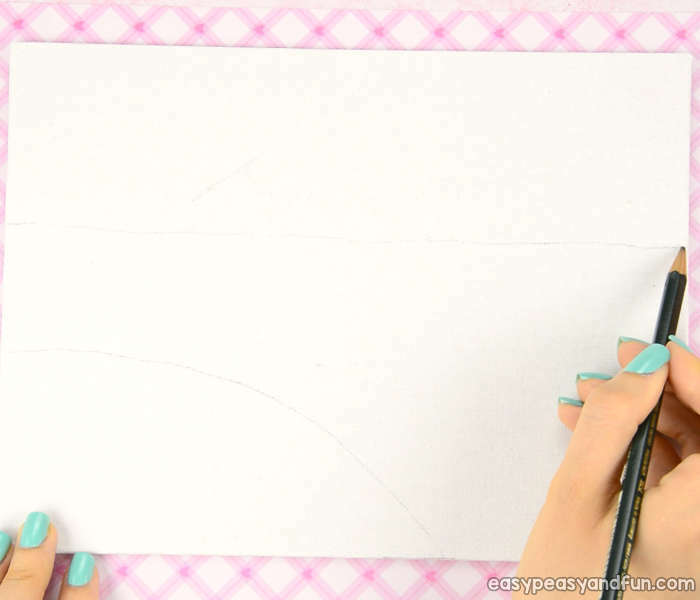 Stick the paper roll on the canvas. 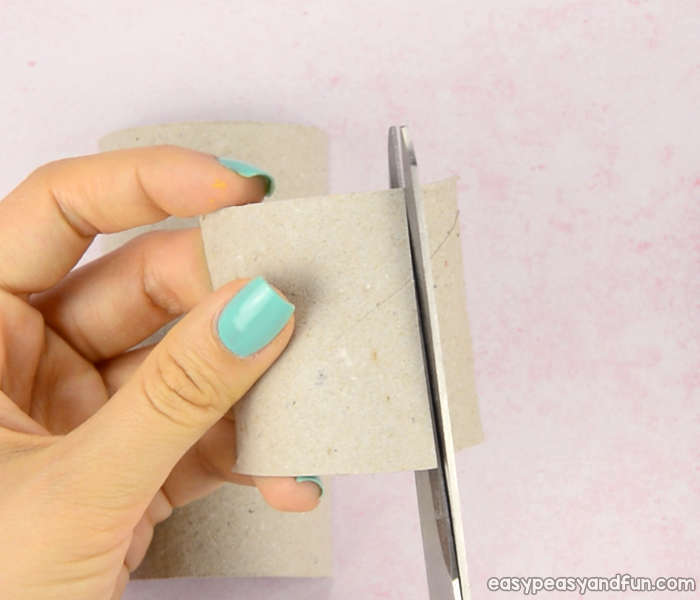 Repeat with the smaller paper roll. Stick it above the large one. Cut a “light beam” out of yellow construction paper and glue it on the canvas. Alternatively you could also paint it. All done! 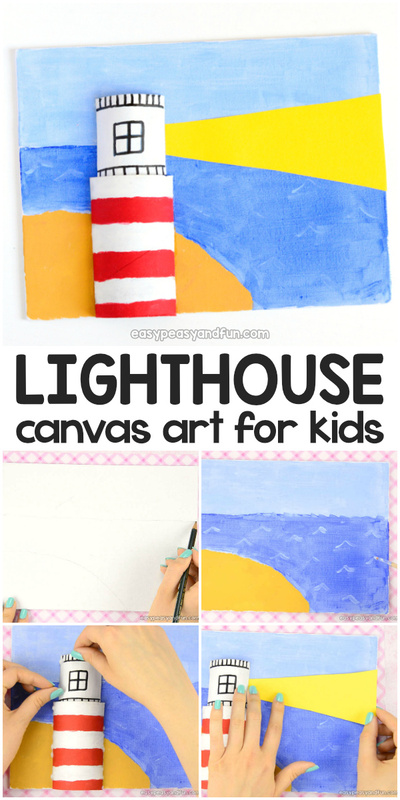 Your Lighthouse Art for Kids is ready to be displayed.